These models are Freeze Resistant, vandal-resistant, circular, vibracast reinforced concrete pedestal drinking fountains that can be used year-round where temperatures may drop below freezing. Model includes a hood extension to protect the polished chrome-plated bubbler head and push button pneumatic activated Freeze Resistant valve system. The circular pedestal design allows the water fountain to be placed conveniently in various locations, without taking up too much space. Bubbler head, push button, and waste strainer are all polished chrome plated and vandal resistant. The easy to use push button requires less than 5 lbs. to activate, making these drinking fountains simple to drink from. Choose from a wide range of custom cement color options and finishes to match these drinking fountains to any environment. For a closer look at the custom colors and finishes, please click on the color options shown below. Now Requires the 3060FR, 3060FR-CC, 3060FR-CF or 3060FR-CCF and one of Valve Systems (Model 6518FR) Listed Below (Sold Separately) for a Complete Unit. Model 3060FR - Round Pedestal (Freeze Resistant) Drinking Fountain. Model 3060FR-CC - Custom Cement Color Round Pedestal (Freeze Resistant) Drinking Fountain. 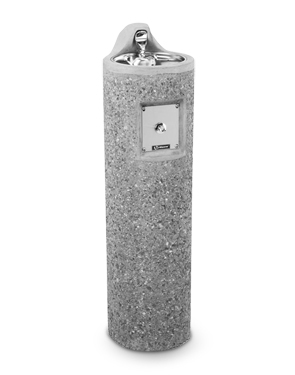 Model 3060FR-CF - Custom Finish Round Pedestal (Freeze Resistant) Drinking Fountain. Model 3060FR-CCF - Custom Color & Finish Round Pedestal (Freeze Resistant) Drinking Fountain.